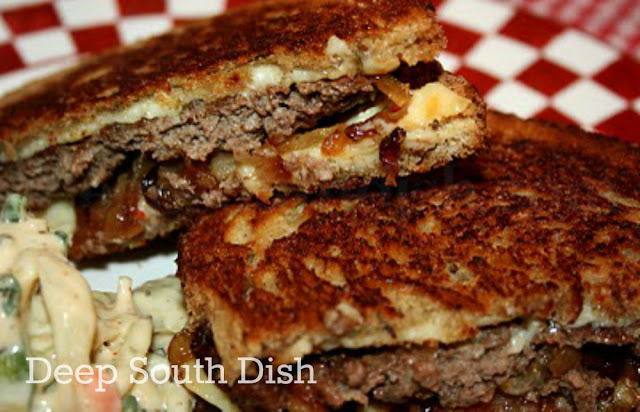 A diner classic, Patty Melts are made with very thin, oval shaped burger patties, and served on thin grilled rye bread, with caramelized onion, and Swiss cheese. Just amazingly delicious! Patty melts have been around forever and are a classic diner food, but I don't hear much about them anymore. I happen to love them though and what's not to love? A thin burger - read that again, thin burger - on grilled rye with caramelized onion, sandwiched between melted cheese - it's pretty much good ole comfort food. When's the last time you had one? Sure looks good to me. So I say, use whatever cheese makes you happy. Here's how to make them. For more of my favorite burger recipes, visit my Pinterest page! Spray a baking sheet with non-stick spray. Shape the meat into four oval shaped patties, place on the pan and put into the freezer for 15 minutes. Meanwhile, heat the oil and butter in a cast iron skillet. Add the onion and cook over medium high, stirring regularly, for about 5 minutes or until softened. Reduce heat to medium and continue cooking, stirring regularly, until caramelized, about 15-20 minutes. Use a slotted spoon to remove the onion; set aside. Sprinkle the meat patties with the garlic salt and pepper. Place into the same skillet, seasoning side down, and turn the heat back up to medium high. Cook until the patties are well browned on the underside, and mostly cooked through. Flip, scatter onions on top and place a slice of cheese on top of the onions. Cover with a lid and move off of the heat source to let the cast iron finish cooking through. If you are not using cast iron, you'll need to keep the burgers over direct heat until cooked through. Generously butter one side of all of the bread slices. Place, butter side down into a fresh large non-stick skillet and place a slice of cheese on top of each slice of bread. Cook the bread until well browned on the underside. Top each bread slice with one of the meat patties and add some of the special sauce, if using. Top with a slice of buttered bread, butter side out, and carefully turn over to brown the other side, gently pressing down. Cook until well browned, transfer to serving plates and cut on a slight diagonal. Serve immediately. Breakfast Melt: Add one fried egg, prepared to order, to each sandwich on top of the meat patty before adding final slice of bread and turning. May also substitute breakfast sausage for the beef. Combine and refrigerate until needed. There is nothing better than a patty melt, nothing! I had one a few weeks ago, as a matter of fact. I'm not sure about the whole swiss cheese thing, but my DH also prefers american cheese. I'm not too particular, as long as there's plenty of caramelized onions. I would probably eat cardboard if you put enough caramelized onions on it, but that's just me. I'm glad things are on the upswing for you. Will keep good thoughts. It's my all time favorite sandwich! Oh, so sorry about your precious doggie. I know how hard it is. Your patty melt looks delish, I make them a lot, but I need to make your sauce too. I'm sorry you had a bad week, just think better days are ahead! The patty melt sounds wonderful, think I know what I'm having for supper. Gluten-Free patty melt! I have missed you! Hope you are feeling better. That patty melt looks scrumptious! Ugh, what a horrible week to endure. Trevor and the mister would get along, he wants to have nothing to do with swiss, muenster, provolone, or anything other than American cheese. Mary - Sorry to here of all your tribulations. I've never lost a pet that did'nt hurt, so I understand. Glad your back in the blogosphere and hope the future is rosier. Oh, I am so very sorry about your pet. Big hugs coming your way from Utah. I am sorry to hear about your dog. I hope your family is okay. This patty melt recipe looks good. I like the use of thousand island dressing on the sandwich. so sorry to hear of your loss!! 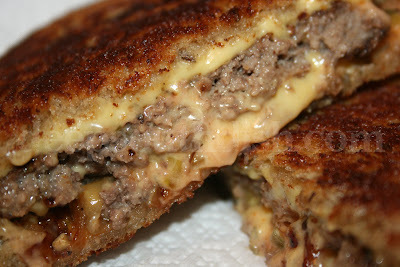 this patty melt looks mighty tasty! Please accept my condolences on the loss of your furry baby. I lost my darling St. Bernard girl only 4 months ago so I so understand. I hope you are feeling better. I love a good patty melt, it's my fav sandwich. And the special sauce sounds yummers. Yum, this does look perfect for getting back on your feet after all that you've been going through. so sorry to hear about your pup. I'm so terribly sorry about your dog. I'm not a dog lover, but I absolutely respect that they are members of the families of their owners and I know it's an awful loss. I've seen your name pop up and being a lover of all things southern, kept meaning to stop by, but this is the first I've made it. I love me a good patty melt. In fact, I was devastated when I took the kids to Lonestar the other night (2 kids eat free per one adult on Tuesdays- YAY!) and they had changed the menu- the HORROR! I was SO proud of myself after making these burgers. I have ALWAYS wanted to make a melt burger and I've never had any success. My hubby LOVED them too (and he's not an onion guy but he loved the whole sandwich). WHATTA HIT!!! Thank you for the recipe. I make patty melts all the time but just wing it. I'll use this recipe today. I also make tuna melts, my family loves them and it is so easy. So sorry about your dog. I am a pet sitter and very attached to all of my clients. All my clients are dogs....(that was supposed to be funny, just probably isn't due to the timing). Do you know why they call this a "patty melt"? I've always wondered ... guess I need to Google that one! Patty Melts are the best thing in the whole wide world. I made some recently that were virtually identical to your recipe, but used mayonnaise instead of butter on the grilling side of the bread. It was an interesting take on a classic and not half-bad. Less greasy than butter and a little crispier. Thanks for all your posts. I have never been disappointed yet and you are my go to blog! Just found this recipe :)) Looks so delish! The Mary Foreman curse. I was looking for the hamburger steak in gravy recipe and stumbled on Patty Melts. I haven't had a good one in years (The Waffle House version is OK but just Ok) Oh my goodness are these good. The thousand island dressing just kicks it up a notch. I couldn't decide on Swiss or American cheese, so I made both. I think I like the American version, although both were REALLY good. Another home run, thank you so much for the recipe. LOL Richard! You're so welcome though I think I'd prefer I be a blessing rather than a curse! :) I'm so glad that you happened upon this one on your travels here though - it's a personal favorite & so happy to hear that you enjoyed it! Yes! The cast iron gives a nice crusted effect but any skillet will work.